A favourite in our household. For a scalloped look, run fork tines down the length of each cucumber before slicing. 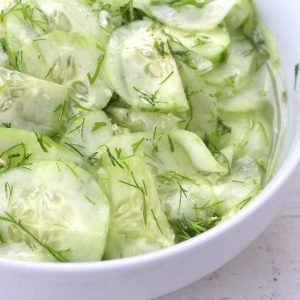 Place thinly sliced cucumber in a medium bowl with lid. Shake vinegar, water, sugar, salt, and pepper in a tightly covered container. Drain salad and sprinkle with dill weed or parsley.